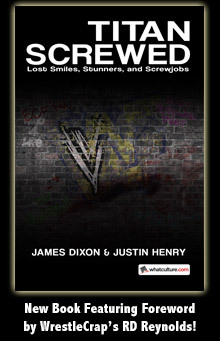 Saturday Morning Slam 02-02-13 - WrestleCrap - The Very Worst of Pro Wrestling! Good morning, WrestleCrap Universe! Welcome to another exciting, mind-blowing edition of Saturday Morning Slam! Now mind you, I don’t quite believe that, but reciting the SMS Narrator’s opening is an easy way to start the column, so that’s what you get. Oh, and he said “WWE”, not “WrestleCrap”. I’ll expect more from him next week. Our opening contest looks to be the payoff from the end of last week’s show, as Dolph Ziggler will be taking on Zack Ryder. This started when Zack being interviewed by Natalya, who he called a ‘broskette’, making her sound like something you’d pour lighter fluid on and then roast s’mores over. Anyhoo, he was talking about how last year at this time, he was the US champ and the guy he beat for that title was Ziggler. He then said AJ was “crazy”, and there you go. Simple build to what should likely be a fun match. 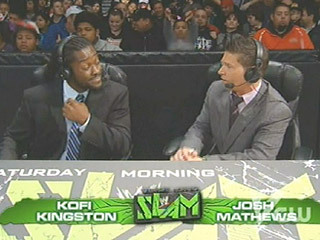 KOFI KINGSTON this week with Josh Matthews. I’d mock this selection, but I have a soft spot in my heart for Kofi, as I think he’s vastly underutilized by the company; anyone remember that one week where they let him be a killer and he destroyed Randy Orton’s car? He was totally believable doing that. Pretty much the next week he was just back to being the boom boom guy. Too bad. Good times. Oh, I should also note he looks quite dapper in that suit. He should wear a suit in all backstage segments, just to stand out from everyone else. Because as you all know, standing out from others is what the company preaches that talent needs to do to get noticed. Which is, of course, exactly what Zack Ryder did, amassing a huge internet following, which has got him…well, continued employment. And a horrendous theme song that he somehow has gotten over as well. Will it help him get a win today, on the only show where he might possibly be able to get a win? Let’s find out. Never knew Vickie had a Bart Gunn fetish. Glad for his career that only lasted a couple of weeks. Oh, and another question…Ziggler’s trunks…are they the first in history with a zipper on them? I mean, take out folks wearing jeans or whatever. And can he use that as a foreign object? Getting hit with a piece of cold rolled steel would be bad enough; having your eyes raked with a dude’s zipper would be downright lethal I bet. Back in the ring, Zack remains in control as Kofi suggests that perhaps “Zack Ryder is a Fighter” would make for a good shirt. I was going to say, “Um, no”, but then I checked out wweshop.com and saw his current shirt just has “SSSSSIIIICCCKKKK!!! !” on it. On first glance, I honestly thought it said “SSSSSUUUUUCCCCCKKKK! !” So yeah, that may be a better idea. To commercial and back we go, returning to Dolph with our “Don’t Try This At Home”. I always kinda question heels doing these, thinking specifically back to Miz last week and how if I was a kid, I’d do the opposite of whatever this jerk was telling me. Then I remembered that Miz was a good guy. Which is incredible, as Dolph came off so much more likable here. Back in the ring, Ziggler takes over following Zack necking himself on the top rope as Kofi talks about how he and Dolph have had “about 999 matches”. As repetitive as this company is, I completely believe that number. Ziggler gets Zack down on the mat, then proceeds to use his body as a foot holster for his sit ups in a great heel move. Never thought I’d say this, but Josh should be in the booking meetings. Maybe leading them. Zack gets a small comeback, but misses the Broski Boot, allowing Ziggler to get the Zig Zag Random Camera Shot to AJ’s Face for the win. Have to say I was expecting more goofiness from these two, but still a good match. …which I totally can’t believe I didn’t steal. But I have now, so yeah, thanks, Andrew! Back to the show, we get a spotlight with Wade Barrett. He explains that where he comes from, the “grim realities of life smack you in the face.” And apparently leave you doused in grease. Seriously, the dude is so oiled up that I think he must have just finished a shift at Jiffy Lube. It’s Saturday morning, I really don’t want to see that. His opponent today is Yoshi Tatsu, who amazingly doesn’t get the same Orient Express music that I believe the company has used for every guy from “the far east” (say that like Finkel) since 1988. So for those who say this company is still living in the dark ages, there’s your proof that they are, in fact, evolving. Yoshi’s music sounds like something out of a Super Mario game, so they’re to at least 1993 or so! This Josh Matthews, he’s winning me over. 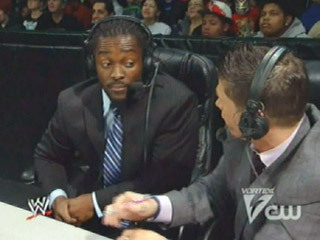 Oh, and Kofi? He talks about how this would be a great win for Yoshi…this MORNING. I know what a clock is. I’ve mastered AM…AND…PM. So yeah, he’s way way way better than Booker already. Oh, and back in the ring, Wade picks up the win with the Black Hole Slam. Cute. You do realize that Wade WON, though, right? Well, two good matches, so a good show. Hope they ramp up the wacky factor next week. Anyone got Michael McGillicutty’s phone number? 14 Responses to "Saturday Morning Slam 02-02-13"
I want to assume that SMS isn’t under the direct control of a McMahon. Remember back when they were running Steven Richards’ “Stevie Night Heat” character, then after about 6 months or so, it was suddenly dropped because a McMahon (Stephanie?) finally paid attention to a Heat taping and disaproved of someome trying to get themself over. 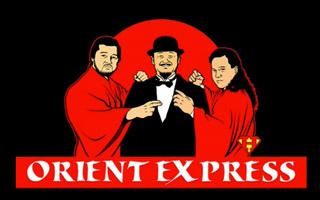 For the record, that Orient Express theme was badass. Remember how excited Takao Omori was at the ’96 Rumble to use it? I wish I had a screen cap of THAT. Oh, I’m sad no Airplane Spin this week. Tony Dawson doing the opening voiceover! Noooooooooo! It sounds like someone just took a bunch of sound clips of him and strung them together, kinda like that South Park episode where they killed of Chef. Wow, you make this show sound awesome. It almost makes me want to wake up early and watch. Almost. I’ll stick to the recaps, good stuff man. I don’t understand why mr. reynolds put emphasis on “MORNING,” IS SATURDAy moring slam filmed at night? It’s filmed before Raw, I believe. And apparently the other men in the booth aren’t always aware of when the show is airing and will openly refer to it being the evening. Kinda like when Punk was on Smackdown recently talking about the match “in two days” instead of just “on Sunday” because he kept in mind that Smackdown would air on a Friday and not the Tuesday the show is taped on. I just watched this episode today on DVR because I keep forgetting it’s on, and I like to sleep rather late on Saturday mornings. This was the first episode of the show I’ve seen, and it wasn’t too bad, but MAN were all the random cuts in place of impact shots really annoying! It was driving me crazy. The commentary was good, and leaps and bounds better than the drek heard on Raw. I did find it humorous that Ziggler won with a “Shot to AJ’s Face”. Never thought he’d steal a finisher from Val Venis. I didn’t expect that on a kid’s show! Which is, of course, exactly what Zack Ryder did, amassing a huge internet following, which has got him…well, continued employment. And a horrendous theme song that he somehow has gotten over as well. The thing that I don’t get about Ryder’s horrible theme song – and there’s no doubt about its horribleness – is why a guy who’s made his name on the Internet has a song all about the radio? Is his next theme gonna be all about how Betamax and VHS taught him everything he knows? I don’t think you give WWE enough criedt. This was a good episode of RAW. The matches aren’t as great as they can be because of certain banned moves, etc.﻿ Especially since it’s PG era. So SMS has to cut away during attacks to the head. It’s one of the rules of it being a kid’s show. With that said, they didn’t cut away to AJ long enough for the ZIg Zag. It’s clearly hitting the dude in the head. It’s why Barrett won with the Winds of Change instead of the Bullhammer elbow. 1. 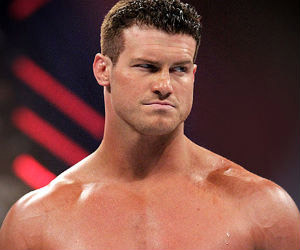 I think Dolph’s hair is naturally brown and he dyes his hair blond. 2. Koalas would fall out of eucalyptus trees. PANDAS would fall out of bamboo trees.